Last summer on my terrace, bugs murdered a lovely, overflowing plant of geraniums — don’t ask me how — only days after I brought it home. I suspect budworms were the culprits since they immediately attacked my next pot of geraniums, subjecting it to a much slower death. First they gobbled up all the tiny flower buds, stealthily destroying them from the inside out. Next they stuffed themselves silly decimating every single geranium blossom, while simultaneously chowing down on the plant leaves, leaving behind only a few pathetic, stripped leaf skeletons. Surrounded by numerous tall apartment houses with MANY windows, I had no doubt numerous neighbors had witnessed my ineptitude in the plant kingdom. Not looking forward to being dubbed the neighborhood plant killer, I prepared a three pronged attack for dealing with the pests this summer. 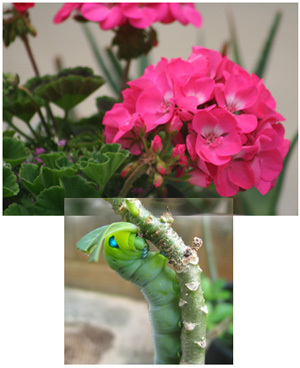 Unfortunately my newest geranium purchase happened BEFORE my research, which informed me budworms had become such a raging scourge in the northeast, many gardeners have totally dispensed with growing the bug’s favorite targets — petunias and geraniums. Swell. Although the worms, which turn into large, fat green caterpillars, apparently also have the hots, though not so passionate, for plenty of other flower species too. But this time when I purchased my new plant I had at least spoken to the grower about my pest problems. His solution? Beer. Works every time, he claimed. So following his advice, I placed a small shallow dish of beer in the planter on top of the soil. So far, at refilling time all I’ve seen in the dish are a dead fly, some unidentifiable fuzzy white things and small black streaks that could be either soil or extremely skinny budworm corpses. If the beer fails to eradicate the budworms, my next move will be to concoct a “ruthless murder spray” of garlic, chili peppers, vegetable oil, detergent and water. And if THAT odiferous brew fails to bring the budworms down, it will be on to Plan Three, which entails taking out my wallet and plunking down greenbacks for an organic pesticide called BT. As it happens, this product also has its tricky side. More than just whiffing the BT spray, the bugs must actually eat the stuff. So it must be applied early, before the budworms begin their drilling-and-disappearing-into-the-flower-buds routine. And how’s your bug situation these days? Dealt with any troublesome critters of your own this summer? Um, no. Martin is the gardener here. I just take pictures of the pretty results. But I am good at other things, like cleaning toilets and changing sheets. I swear I’m not a slacker. A slacker? Can no way imagine you hanging around and goofing off. With your app work and now your clothes creation, it’s clear: when you commit to something, you COMMIT!!! Beer? Really? I don’t dare tell my husband, who is very fond of his beer. Actually, web research indicated the beer was a good deterrent for snails and grubs. And not sure if budworms that turn into caterpillars qualify as grubs. A quick update for those afflicted with the budworm problem. So far, replenishing my little beer dish with fresh beer when needed (have used about a full can since 6/6) seems to have kept the budworm scourge at bay. Between that and feeding my geraniums miracle-grow, my terrace flowers have never looked healthier. (I keep the opened beer in a tightly lidded jar in the fridge). Update. The budworms have arrived. Put on my close-up glasses to examine the plant and boom – there they were. Already fat and green and 3/4″ long, making them easy to spot. Plucked off 21 and drowned them in my beer. Best time to see them is when they feed early in morning and at dusk. Preparing my killer spray for Plan Two. Update. Killer spray seems to be working. Haven’t found budworm in days. But a few of them are still THERE. (Holes in a few buds and black poop grains on leaves). So it looks like this will be an ongoing project. Have also placed a little of the spray liquid in my beer dish. Smells to high heaven, but it may be helping to knock the buggers off. Update! This past week many of plant leaves have suddenly turned yellow. Usually this means over-watering, but haven’t been watering more than usual. Have been picking off a few bud worms every day, but plant is looking so unhealthy, hesitant to hit it with more garlic spray. Usually by this time each summer ALL the geranium blossoms have been eaten, so I’m ahead there. Final update. Alas, my geraniums are on their way to plant heaven. Hurricane Irene dealt the final blow. In stowing them against the building for protection, i was not able to get to them for a few days after, during which they just about drowned in their full water dish. Needless to say, geraniums have bloomed their last on my terrace. Next summer am going to give some other flower species a try.